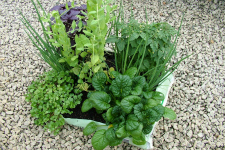 Grow a mini herb and vegetable garden with just a bag of potting mix and some seedlings. No pot needed! They will grow in front of your eyes if you use premium potting mix. Place the bag of potting mix in the place that it is going stay. It would be best if it is on gravel, free draining sand or a rubber mat with holes in it. Don’t leave it on a timber deck as the moisture underneath might cause damage. Flatten the bag on the floor. Poke at least 8 drainage holes in the plastic. Flip the bag over and flatten it out again. Cut a square hole in the top of the bag leaving the sides of the bag to hold in the soil. Use a dibbler or fat stick to make six holes in the potting mix. Put a seedling in each hole, gently pushing the soil around the root ball. Water the seedlings lightly and water every day so that the potting mix doesn’t dry out. A mixture of continuous harvest lettuces.